Ananth Seetharaman, department Chairman and Professor of Accounting, holds the Don and Donna Millican endowed chair. He joined the UNT faculty on September 1, 2016. 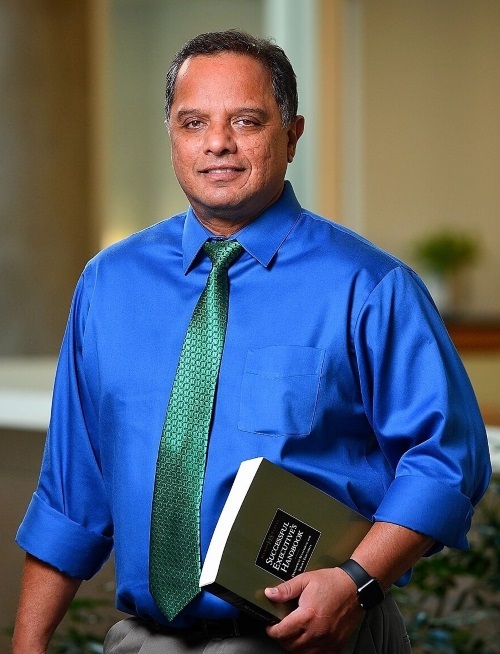 Prior to this, Ananth served as the Ernst & Young Distinguished Professor and chairman of the department of accounting in the John Cook School of Business at Saint Louis University. Dr. Seetharaman earned his PhD, MBA and Master of Taxation degrees from Georgia State University. His principal teaching interests are in income taxation and managerial accounting. He has taught courses at the undergraduate, Master of Accounting, and MBA levels. He is an award winning teacher. Despite his administrative responsibilities, Ananth has maintained an active research agenda and his research has been published in several premier and high-quality academic and practitioner journals including the Journal of Accounting and Economics, The Accounting Review, Financial Management, Accounting Horizons, The Journal of the American Taxation Association, The Journal of Accounting, Auditing and Finance, The Journal of Accounting and Public Policy, and the Journal of Accountancy. Dr. Seetharaman is a chartered accountant from India (inactive) and a CPA (Missouri) and a CGMA. In his spare time, he enjoys riding his motorcycle, playing guitar, traveling, and spending time with his friends and family.